Now here's a cool looking Daemon Engine for Chaos. Like Forge World was going to put out something bad looking though? I'm not going to delve into the rules for this guy, but I did see that he can be given specific Chaos marks to align him with particular powers. I wonder if this opens up the possibility of Forge World releasing individual, mark specific shoulder armour for this guy. Don't get me wrong, I like the standard Chaos star, but I can imagine some really cool looking chaos power daemon engines too. I'm sure folks are going to convert their own engines to match the chaos power they want and that's going to make for some gorgeous conversions. I am bummed that my little Imperial dreadnoughts are tiny in comparison to this guy. This guy seems (looks) really dangerous. 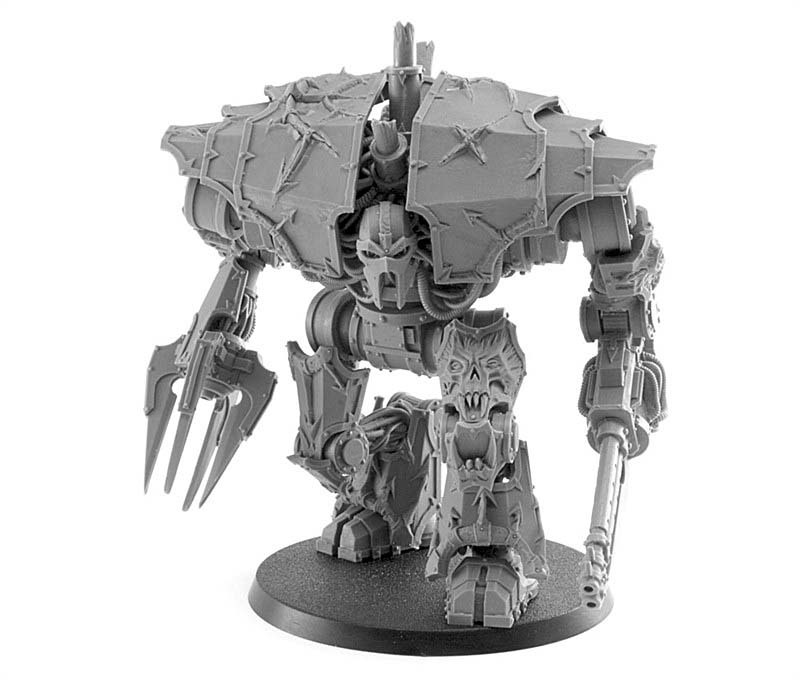 I wonder how he compares next to a Grey Knight Dreadknight model? I know it might seem silly, but I really like the feet on Forge World dreadnoughts. I think the foot style ones look far better than the "plus sign" pads that come on regular dreads. 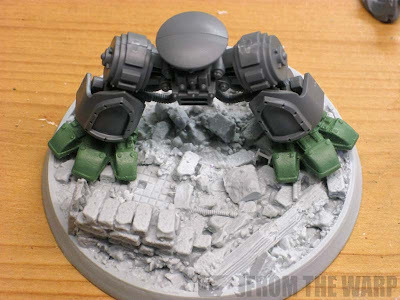 I have a regular GW dreadnought I'm slowly building and I managed to get some Forge World feet for him. The trouble is, on a GW dreadnought, the legs are slightly angled. It's not much, but it makes a difference when you put the Forge World feet on there. I thought about straightening out the legs and making them a bit more upright like FW dread legs actually are, but it looks like it might be a huge amount of work. I may have to bite the bullet and do it now. It could be a lot of work, but it might make my little dreadnought stand just a bit prouder when compared to this new Chaos monstrosity. Heh, I'd never really thought of that before, but I also prefer the FW dreadnought feet. One thing I've not tried to do is use a regular GW dreadnought with one of FWs dreadnought bases http://www.forgeworld.co.uk/Warhammer-40000/SPACE-MARINE-MKIV-DREADNOUGHT-BASE.html Slightly more expensive than just using greenstuff, but a time saver as well (if the legs are compatible). I really like the 'plus sign' feet, gives me the sense that they're incredibly bulky as they need the balance from all directions. The new Decimator is absolutely sick though! I'll be converting a Decimator into a Loyalist once I get my hands on one. Hoping to make it a Golden Demon entry this year along with my Mechanical Pegasus figure. If/When you reposition the legs, toss it up here if you would? I'd love to see the process! That new model is really cool looking. The detail is really nice. @Tim: I could really see it being able to be made into a Loyalist one very easily. I would be interested in seeing that! Oktane: I'm going to have to look around for ideas, I need to keep it as simple as possible. Fortunately, there is the front armour plate that hides a good bit of the connection. Tim: Will do. It might take me a while, but if I do it, I'll post the process. the new deamon engine does look cool. i wonder if this is rethink for GW release policy. after the space wolves, thunderwolves were delayed due to a legal issue with other modelling companies making models for codex units that GW hadnt released yet. could this mean the long rumoured chaos legions codex is being warmed up by forge world? Just make your dreads taller like I did. A little stilt is pretty easy and adds 1/2 an inch which is huge. I noticed this guy can be taken in a Daemon army too! Can't say I've ever handled a FW dread, but it looks like you'd almost want to widen the hips instead of just straightening them. GavCee: Now there's an interesting line of thought to say the least. To think FW is getting things warmed up and providing some "alternative" models before we even know they will be options opens all kinds of wishlisting. Reece: Interesting. I guess he acts like any other daemon selection and deepstrikes in with his half of the army then? Anon: I think both the GW and the FW hips are the same width. The difference being the GW dread legs spread out a bit and the FW ones are upright. A wide stance vs. a normal stance. I like it but imo it also looks a lot like a big WARMACHINE warjack. Maybe GW will do something like that for a new csm dreadnought? Anon: I like that Chaos gets something different looking... but like you mentioned, why so big? And that's a good question, will they get revamped dreadnoughts too?